MUSIKMESSE 2015:The DOD pedal resurgence continues apace with a new distortion to add to the line. The Gunslinger aims to bring high gain with tube character to the table. DigiTech claim that the Gunslinger's MOSFET circuit is willing and able to offer saturated tones and the kind of sensitivity to your playing touch that's normally associated with tube amps. "The pedal is ideal for adding a little more complexity to already overdriven tones, or on its own for thick, rich chord rhythm crunch and singing high-gain lead tones," says Tom Cram, the company's Marketing Manager. 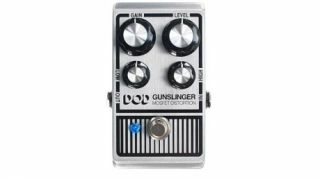 The DOD Gunslinger MOSFET Distortion pedal is expected to ship in June 2015 with an RRP of £85.00.